Behavioral Neuroscientists study the behavior of animals and humans and the neurobiological and physiological processes that control it. Behavior is the ultimate function of the nervous system, and the study of it is very multidisciplinary. Disorders of behavior in humans touch millions of people’s lives significantly, and it is of paramount importance to understand pathological conditions such as addictions, anxiety, depression, schizophrenia, autism among others, in order to be able to develop new treatment possibilities. Encyclopedia of Behavioral Neuroscience is the first and only multi-volume reference to comprehensively cover the foundation knowledge in the field. 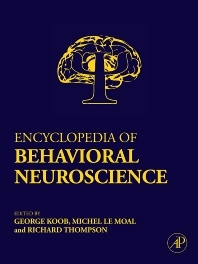 This three volume work is edited by world renowned behavioral neuroscientists George F. Koob, The Scripps Research Institute, Michel Le Moal, Université Bordeaux, and Richard F. Thompson, University of Southern California and written by a premier selection of the leading scientists in their respective fields. Each section is edited by a specialist in the relevant area. The important research in all areas of Behavioral Neuroscience is covered in a total of 210 chapters on topics ranging from neuroethology and learning and memory, to behavioral disorders and psychiatric diseases. Richard F. Thompson is Keck Professor of Psychology and Biological Sciences at the University of Southern California and was founding Director of the Neuroscience Program at USC (1989-2001). Prior to this he held tenured professorships at the University of Oregon Medical School; University of California, Irvine; Harvard and Stanford. He received his BA degree at Reed College in Portland, OR, his BS and Ph.D. degrees in at the University of Wisconsin, Madison, and did postdoctoral research in Neurophysiology at the University of Wisconsin School of Medicine (with Clinton Woolsey) and the University of Göteburg School of Medicine in Sweden (with Anders Ludberg). His research has focused on neuronal substrates of learning and memory in the mammalian brain; most notably, he (1) elucidated the defining behavioral properties of habituation and sensitization and analyzed the underlying brain processes, and (2) localized and analyzed the essential memory trace for a basic form of association learning and memory in the mammalian brain (to a region in the cerebellum). He has written several texts, published some 470 research papers to date and has received many honors, including election to the National Academy of Sciences, the American Academy of Arts and Sciences, and the American Philosophical Society. He was awarded the Distinguished Scientific Contribution Award from the American Psychological Association, the Warren Medal from the Society of Experimental Psychologists and the Karl Spencer Lashley Award from the American Philosophical Society.